Sellers are back in control of the price action this fall. Wednesday's breach of $137 support is a sell signal. International Business Machines (IBM - Get Report) is having a rough session: Shares are shedding around 7.5% Wednesday afternoon, following third-quarter earnings. While IBM actually managed to post a profit number that was slightly above analysts' expectations, the company whiffed on revenue and saw a second straight drop in its high-margin (and closely watched) Cognitive Solutions business. This isn't exactly an unprecedented move lower; IBM sold off 7.53% back in April when it reported first-quarter numbers. But the difference here is in the price action. Simply put, IBM's price action looks busted following this latest blow to the firm's stock price. To figure out what's going on in shares of IBM - and what to do with it from here - we're turning to the chart for a technical look. At a glance, Wednesday's session is ugly, but it's actually more or less been par for the course in October. Shares of IBM have shed a whopping 12% of their market value since the calendar flipped to October, underperforming the rest of the S&P 500 by a broad margin. 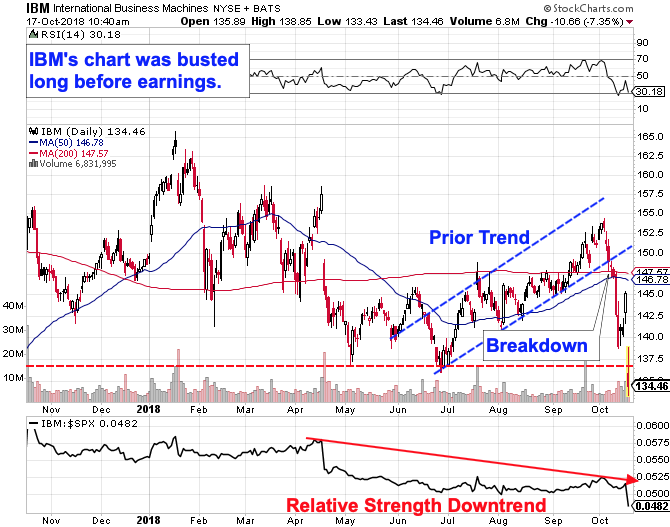 IBM's violation of its near-term uptrend back at the beginning of the month provided an important early warning that control of shares was flipping from buyers to sellers. Now, with shares violating the support level established this summer, sellers are clearly in control of things. And Wednesday's breach of $137 support is a sell signal. What that means for IBM bulls is that it makes sense to stay on the sidelines and wait for the selling to cool off before trying to jump in and buy shares. With support at $137 taken out, more downside from here is a high-probability trade. Relative strength, the side-indicator down at the bottom of IBM's chart, adds some extra confirmation to the sell signal we're seeing here. Relative strength has been in a downtrend of its own all year long, indicating that IBM has been systematically underperforming the rest of the S&P 500 year-to-date. In other words, even if IBM was still in its uptrend, there are other alternatives on the market today that are working better for investors' portfolios than IBM. It makes sense for investors to steer clear of IBM until buyers can take back control and get Big Blue to catch a bid again.